If you’re anything like us, dropping $150+ on a pair of sunglasses isn’t only an assault on your budget, it’s impractical. Sunglasses need to be priced low enough so it isn’t a nest egg emergency when you lose them, sit on them, or crush them in your messenger bag. That’s where Knockaround comes in. The San Diego based start-up offers designer-worthy shades for less than two tickets to the movies. My favorites are the “Fort Knocks” in Frosted Grey. The translucent plastic is a welcome addition to this modern, streamlined take on the classic Wayfarer shape. The spring-loaded frames are light on your face, but don’t feel chintzy in your hands. Here’s to looking great in your sunglasses on the cheap before you crush them/leave them in your friend’s car/lose them to your girlfriend. For more shapes and colors check out Knockaround’s site. But are the lenses glass or plastic? I wait for Sunglasses Hut to have a 2-for-1 sales and get my Ray-Bans for 80$ or so each, two at a time. Some people still think that’s too expensive, but once you get a pair of sunglasses with glass lenses you’ll NEVER want to go back. If I could get a pair of quality sunglasses with glass lenses for 25$ I’d go wild. I believe the lenses are plastic. The 2 for 1 sale is awesome! 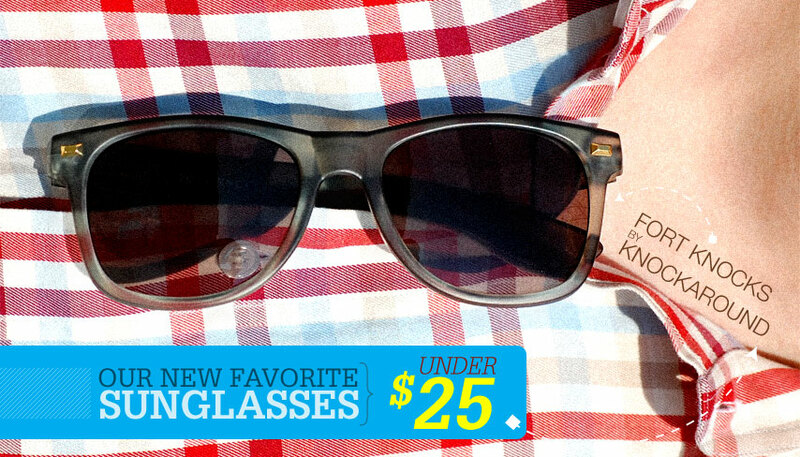 Good deal on Ray-Bans. Agree with Dead Sea… once you go Ray-Ban it’s hard to go with anything else. I have a pair of polarized New Wayfarers and a sportier pair as well. I’ve owned Smith, Oakleys and even went the uber-cheap throwaway pair route for a while… but now that I’m back to Ray-Bans it’s pretty hard to see me going with anything else. And these are really just another pair of inexpensive Wayfarers at the end of the day. The look might be there, and cheers to my hometown of San Diego, but I can’t imagine the feel is there. They are indeed another pair of inexpensive, cool looking wayfarer types. That’s why I like them! Cost vs quality is something everyone wrestles with, these shades would be perfect for a guy who wants to look great on the cheap. For someone like you who places a lot of value in the heft of their sunglasses, higher priced options make the most sense. I checked with Knockaround, they said the frosted grey should be back in stock in mid-July. Just leaving this comment for potential future readers – I have the Fort Knocks in tortoiseshell and I like them a lot. Awesome shades for the money. And unlike a lot of plastic glasses I’ve tried on, they are comfortable and sit well even on my slightly asymmetrical schnoz. However, they are quite large on my small-to-medium sized face. If you’ve got a tiny noggin, these might be way too huge for you. Fairly ye be warned. This is a sure way to look great on the cheap. They look awesome! I’m too big of a fan of my Maui Jim’s to try anything else. IMHO, great value for your money ($80-$100 a pair). I own too and am never looking back. Anyone looking for the frosted gray/smoke, its out of stock right now. are you able to see through the smoke lenses?